Gauge isn't really of a concern here. In fact, you can make different sized plushies with different sized yarns and appropriate hooks. Just make sure the hook and your tension result in a moderately tight stitch so that the stuffing won't show through. In my work I tend to prefer joining rounds with a slip stich, if you prefer to use the 'amigurumi' style of continuous rounds with stitch markers, that also works well. Number in () at the end of each rnd indicates the total number of stitches that should be in that round (or rounds). NOTE: It's a good idea to begin stuffing the piece at this point (if you haven't already). Stuff the head and body moderately firm. F/O and using yarn needle, add any little bit of stuffing that might needed to finish filling out the bottom and weave yarn thru very last round, pull tight to close off neatly and weave in ends. Sew the two tail pieces together by either whipstitching, or using sc even around the edges. (you can place pipe cleaner in between them to add poseability, but this is purely optional). Stuff the arms and sew to the body using the picture to help with placement. Stuff the ears and sew them to the head using the slight slant of the final row of the ears to give them a slight backwards tilt. Sew feet to the bottom. Sew the two 'stripes' to the back using picture for placement. Sew the tail to the bottom of the backside below the bottom stripe at an angle. Sew the small brown triangle over the bottom of the tail as shown. Sew buttons (or eyes) onto face. Using small amount of black, add nose using a few small whip stitches. Sew felt circles to sides of face (or make small ring with red yard using six sc in magic ring). Using small backstitches, add mouth as shown. Pikachu and Pokemon are copywrite by Nintendo. This pattern is an original pattern by Linda Potts (March 2009). Please do not claim this pattern as your own. If you wish to share this pattern, you may link to this pattern but please do not reprint it on your site. You may keep a copy for your own personal use but you may not sell or distribute it, or sell items made from this pattern. Great job! Do you have the pattern for the pokeballs? No, it wasn't a mistake. It was intentional. hey can u email me a sewing version of this? I'm sorry, but I don't have sewing versions. I only design crochet patterns. You could possibly find sewing patterns for pikachu plushes online though. Hi your pikachu is really fantastic. I did one for my kid and he's crazy about it. If you want or need, I translate your pattern in french. I just don't know how to give it to you. Excuse my english but I'm french. It is rather interesting for me to read this post. Thanx for it. I like such themes and everything connected to this matter. I definitely want to read a bit more soon. Thanks for the great pattern. My son loves Pikachu, so I plan to make him one for X-Mas this year. Keep up the great work. I don't know why it won't print, I have no print restrictions on this page at all, so it should print fine. If anyone else has an idea as to why the trouble with printing, maybe they will post it. in round 4 of the ear, it should be sc in first 5 sc, 2 sc in last to create seven stitches. Hey! This is a great pattern and I'm almost done, I've got all the parts made. I just have one question: when sewing the tail to Pikachu, should the wider stripe with the hdc and dc be sewn to the body, or should that be sticking away from him? Thanks! I'm really excited to have this done =D these patterns are so cool! You can use the pictures at the top of the pattern to help you in placing the tail. I'll be perfectly honest with you, it's been SO long since I made this one, I can't remember exactly which end I sewed to the body. Thank you so much for sharing this! You're amazing! I really want to try this out but I'm wondering how big is this Pikachu? About how much yellow yarn will I need? Thank you so much for posting this! My daughter is in love with Pikachu and I am going to try to make one for Christmas. Better than me making a blanket. It is so amazing you are able to create and share these! Somewhere above someone commented that you put the tail on backwards, and you said that it wouldn't stay up right if it was on correctly...well, when I made this I found that you can sew one of the corners of the tail, the part that's at a 90 degree angle, to the brown stripe and that will keep the tail up while allowing it to be placed properly. I like this character toy very much. I have the hobby of collecting Godzilla Plushies. Hi! I'm having a problem with your pattern. I'm not sure if I'm reading it wrong or if theres a typo, but in Rnd 3 of the head and body, it sounds like you crochet one single crochet into the first stitch then two into the next then one in every stitch after that. This would make sense except I'm supposed to have 24 stitches at the end of the round and instead I get 18. In other rounds I have a similar problem where the numbers don't seem to add up. Would you mind helping me? Thank you so much! Thanks again for the wonderful pokemon collection. Their lovely!! I just sewed the brown on the back. It made a character a little larger then my fist. I hope its ok :). could you make a giant plush like this? umm...on row 14..so do you mean sc in next 6 stitch dec 2 times then sc in next six dec then repeat around??? would you please consider making a ledyba? Hi Wolfdreamer, I LOVE your patterns. I was working on this pikachu and i was just wondering how to do a back stitch or a whip stich for the nose and mouth. could you like make a tutorial for me with a video or written instructions? and thank you in advance. Your work is SO AMAZING. I CAN NOT find any patterns in knit for Pokemon. And even then I bet they wouldn't be as good as your patterns. I actually couldn't crochet a stitch, but I had to give in to your patterns to make something for my friend's bday. 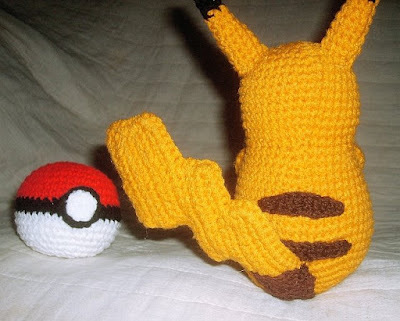 So I started crocheting the pikachu. And with a little help from the Internet, I COULD CROCHET. Just wanted to let you know that I LOVE your patterns!! And I've probably made about 20 pokeballs in various sizes and colors :) They made and awesome addition in my son's bday goodie bags too! Thank you again for sharing such wonderful patterns!! And I'm a noob when it comes to crocheting, do you think I would find this difficult? I have only just learned to crochet over this summer break (I'm in NZ) I loved looking at your patterns, but could only crochet to a pictorial scheme. Yesterday, I taught myself to read a pattern using a japanese site and google translate and realised how the patterns 'worked' - at least for ball shaped things - and now am half way through my first pikachu! My sister is really excited because she is into cosplay and wants to show him off! hehe. There are no decreases in row 15. There are single crochet (sc), half-double crochet(hdc) and double crochet (dc). Hi! I was reading through this pattern and I was wondering what you meant by F/O...I have a feeling that I already know but I am very forgetful, so could you please help me out? 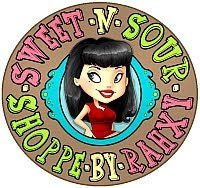 P.s I am now following your amazing blog!! I'll post a photo of my finished Pikachu on my blog if you'd like to see it! hello...just had a quick question. How come you never mention to chain one at the end of a row before you turn? You would have to ch 1 in order to have the number of stiches you mention in (). 1. Chain 1, skip the first stitch and continue your row, making the chain 1 the 'first' stitch of your row. 2. Don't chain, and work your first sc in the actual last sc of the previous row. The benefit of NOT doing a ch1, is that you have a firmer edge to sew up your doll parts/pieces. Chaining to turn creates a weaker edge suitable for garments, but it leaves gaps in a doll when it's stuffed or sew together. You keep your stitch count, but end up with a firmer edge to work with. If you're making a scarf or other garment, which will have an 'open' edge ... using the 'no chain' turn also results in a *much* cleaner edge with a tighter form that looks as if you went back and intentionally created the edging. If you follow the pattern as it is, you'll notice that the result is nothing like the picture. the ears/arms/feet/tail are too small for that body. I'm sorry if you had problems with the pattern. Many many others have made the Pikachu and had no problems. Many things can affect the size of the parts of crocheted dolls. Tension when working, amount and type of stuffing, etc. Sometimes when making these crochet dolls, you have to adjust for your specific style/tension and materials. This is a very good pattern! I modified some of it cause the body for whatever reason was a bit fat for me so the arms were too short and... Well, it happens. Whatever. In the brown portion of the tail you have to -"ch7, sc in 2nd ch from hook then sc the remainder(6). Then row 2 you have sk 1st ch then sc in remaining (6 sc) but isn't it (5) if you are sk the 1st sc in row 2? Great pattern! Made one for my 7 yr old and they loved it so much that my 3 yr old demanded his own. On the second, I used the brown yarn for the first section of the lightening bolt instead of attaching a separate patch. Both versions came out great! Thank you for the pattern!! "Rnd 14: sc in next 6 sc. dec over next 2 sc. Sc in next six sc. dec around" and I'm guessing you meant "Rnd 14: (sc in next 6 sc, dec over next 2 sc. Sc in next six sc, dec) around"
If I'm wrong, I'm terribly sorry and I apologize. Either way, SO CUTE!!! Have you done a Pokémon Pickachu hat for teens? I can't find a good free pattern. Your work is really good. thanks for making the patterns available. My grandson would love a hat. How big is this pokemon? Thank u! I made this pattern for a baby just put black circles sewn on and used smaller hook. Thanks for a great pattern and all the work you do. I am almost done making the body including stuffing, and as it seemed the whole time I was working, the head is very flat and there isn't much of a neck. It doesn't really look like a head; the whole thing looks like an oddly shaped yellow eggplant. What is going on? My fingers hurt from crocheting all those little pieces. I think it might be my choice of yarn: a not stretchy cotton, so it's hard to get the hook through, especially on the ears, arms, feet. Next time, stretchy and soft. I just finished this up for my daughter and she loves it! Most of the character dolls average about 9 inches tall (with the obvious exceptions like Lugia). Your exact results will be a little different depending on your choice of yarn, hook and your individual tension when crocheting them. Hi. 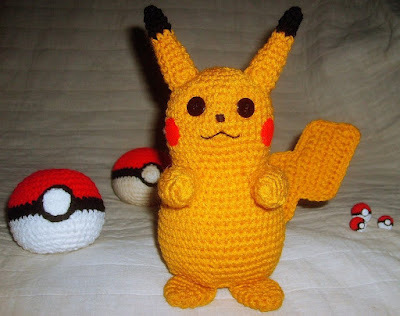 I am looking forward to making this Pikachu for my niece. Can you please tell me which yarn did you use? This is fantastic! I have made your Mario and Luigi and TMNT. I was wondering if you have a Yoshi pattern? My grandson LOVES Yoshi. Thank you for all of your wonderful patterns. Thank you for the pattern! I'm making this as a gift for a child and I'm sure it will be well loved! Does this mean to alternate single crochet and decrease all the way around? If so, I get 12 stitches remaining, not 9. Alternatively, if I single crochet then decrease for the rest of the way around, I seem to have one extra stitch remaining of the previous row's 18. Please advise? Thanks!